Bicyclean Helsinki has been added to your itinerary. 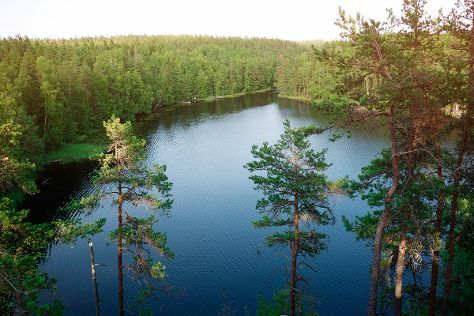 Take a break from the city and head to Nuuksio National Park and Sipoonkorven Kansallispuisto. Satisfy your inner culture vulture at Rock Church and Sea Fortress Suomenlinna. Explore the numerous day-trip ideas around Helsinki: Espoo (Arctic Expedition & Kaitalampi), Söderskärin majakka (in Porvoo) and Tuusula (Lotta Museum, Halosenniemi Museum, & more). Pack the 12th (Fri) with family-friendly diversions at Linnanmaki Amusement Park. And it doesn't end there: make a trip to Market Square Kauppatori, appreciate the extensive heritage of The Esplanadi Park, get a taste of the local shopping with ARTag Gallery, and kick back and relax at Aurinkolahti Beach. For where to stay, reviews, and tourist information, go to the Helsinki holiday planner. Rio de Janeiro, Brazil to Helsinki is an approximately 19.5-hour flight. You can also do a combination of flight and train. You'll lose 5 hours traveling from Rio de Janeiro to Helsinki due to the time zone difference. Traveling from Rio de Janeiro in July, expect Helsinki to be little chillier, temps between 25°C and 15°C. Finish up your sightseeing early on the 25th (Thu) so you can travel to Loviisa. Loviisa is a municipality and town of inhabitants on the southern coast of Finland. Get some cultural insight at Nasin Kartanon Galleria and Porvoo Museum/Holm House. Head to Riimikko and Brunberg Candy Factory Shopfor plenty of shopping. Explore the numerous day-trip ideas around Loviisa: Porvoo (Porvoo Old Town, Porvoo Swimming Pool, & more). It doesn't end there: take in the architecture and atmosphere at Loviisan kirkko and take in the spiritual surroundings of Orthodox Church Porvoo. To see ratings, other places to visit, and more tourist information, go to the Loviisa attractions website . Traveling by car from Helsinki to Loviisa takes 1.5 hours. In July, plan for daily highs up to 24°C, and evening lows to 15°C. Wrap up your sightseeing on the 28th (Sun) early enough to travel back home.